Is Zacharias Long from Pennsylvania the same person as Zacharias Lange, a Brunswick mercenary who deserted his regiment to join the Continental army during the ARW? Because of the uncertainties that I have noticed around this individual in many family trees in Ancestry, I have decided to do some research hoping that I could help this family come to grip with serious questions about their ancestor’s origins. 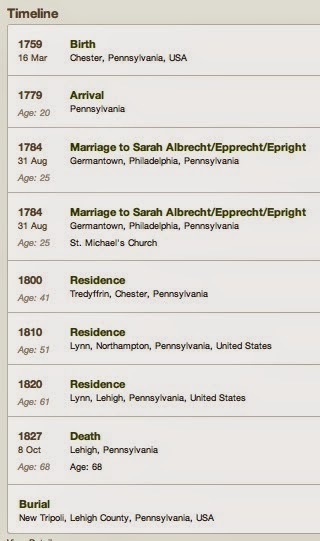 Let’s start with screen captures taken from one family tree pertaining to Zacharias Long. You will also see why I’m so critical and skeptical about the information found in the great majority of family trees on Ancestry. I have no reason to question this timeline, except that there is no birth certificate for Zacharias. Sure, there is a birth date, but who are his parents? It is possible that this birth date was given by Zacharias himself. How come that no one in the family seems to know about his origins? Maybe, this family is struggling like thousands of other immigrant and Hessian families who came in America during the 17th and 18th century. This capture shows also the difficulty encountered by many families searching for their ancestors. The family name of Sarah is written in three different ways. I came across a family that found 21 different ways of writing their family name since their ancestor arrived in America. Stephen Long participated in the Long DNA Surname Project surely because he is looking for the parents of Zacharias. He didn’t seem to be sure about where Zacharias was really born and, like many families, he turned to DNA testing hoping to find relatives overseas. I will tell you about my view on DNA later. The capture below is enough to foul anyone about the origins of Zacharias. He was enlisted in a Patriot regiment during the ARW. Who would believe that he has also participated in the ARW on the British side? If it seems improbable, that’s what happened to many Hessian soldiers: hundreds deserted to join the enemy, even Philipp Lange... Zacharias could be one of them, but it remains to be documented. General Washington didn’t like the British and Hessian deserters to join his army. Many of them were only spies waiting to cross the lines and bring strategic information to their mother-regiment. The Hessians were soldiers by trade. After the ARW, Zacharias continued to be part of a regiment. Zacharias is listed in Claus’ Index but not in HETRINA at the Marburg Archives in Germany? Why? The Brunswick mercenaries are not listed in HETRINA. 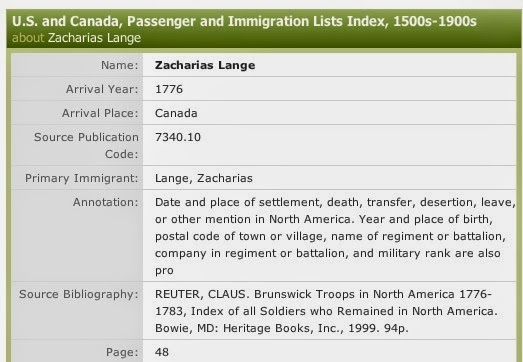 This index says also that Zacharias stayed in North America (Canada) after the ARW was over in 1783. Most of these indexes are not very specific about the whereabouts of all the Hessian soldiers. They pick their information from various sources that they don’t always make public. Helmut Merz does not have any information about Zacharias, at least in his book titled, The Hessians of Quebec. But, there are some other « desertion » sources available that could tell something about Zacharias. The Brunswick Regiment of Riedesel was the first to arrive at the onset of the ARW and the regiment went to Quebec as you probably know. Did Zacharias stay in Canada at the end of the ARW or did he went to USA? The following capture might lead us to a different scenario. This Index by Linn & Egle tells us that an individual named Zacharias Lange came by boat in 1779 in Pennsylvania and signed the Oath of Allegiance, making him an American citizen. It seems that, soon after, he enlisted in a Patriot regiment for the remaining of the ARW. 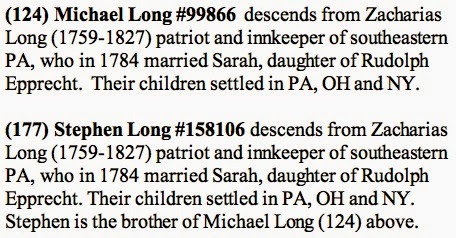 Of course, this is simply an assumption on my part, since I have no document that Zacharias Lange who arrived in Philadelphia in 1779 is the same who enlisted in a Patriot regiment. An effort should be made, also, to demonstrate that Zacharias was not part of any Continental regiment before 1779. Is it possible that this Zacharias Lange came from Germany as a « regular immigrant »? The following capture proves that no ship came from Germany with immigrants during the ARW. Why was there any immigration during that period? The main reason is that the ships were mobilized to transport soldiers from Europe to America and between different ports on this side of the Atlantic. 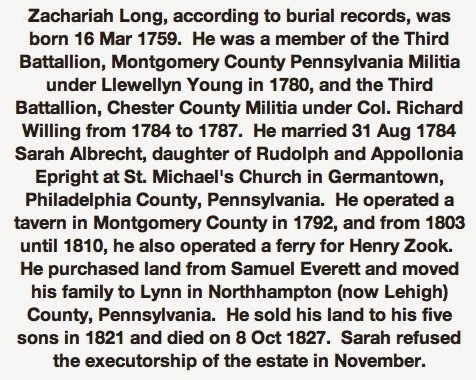 Capture No 7 doesn’t prove that Zacharias Lange became Zacharias Long the ancestor of this Long family in Pennsylvania. True. Some research has to be done to link these two names together. We already know that most of the Langes and Langs tended to change their European name to the British name of Long once they set foot in America. It remains to be proven in this particular case, as in each one of the cases encountered. How can it be proven beyond any doubt two centuries after the fact? Later, I will tell you what I would do to link these two names to a one and only person. The following capture is about the death of Zacharias Long. Once again, the family is in doubt about his origins. If you search any genealogical database, for instance Ancestry and LDS, you will not find a birth certificate for Zacharias Lange. These databases contain only a fraction of all the birth certificates. 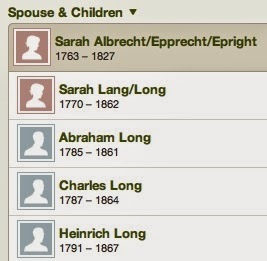 If you want to find a birth certificate for Zacharias Lange, I’m out of suggestions because I’m already trying to find the one for Philipp Lange in Germany. In my case, though, I know of which faith he was. That is helping me pinpointing a particular church and reducing the scope of my search. 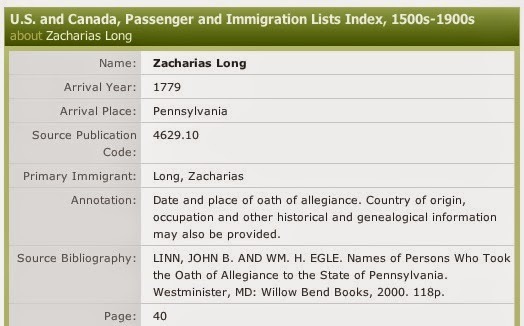 In the case of Zacharias Long from PA, I assume that they have found a birth certificate. There are many family trees about Zacharias on Ancestry, but no one in showing such a certificate. Why? By now, you should be able to guess what kind of scenario that I proposed for Zacharias’ origins. This is to be taken as a research hypothesis only, an assumption. Zacharias Lange came from Germany with the Brunswick Regiment and was garrisoned in Quebec in 1776. He later deserted his regiment like many other mercenaries and traveled to Philadelphia where he became an American citizen and, later, an American Patriot. Since that was the case for many German mercenaries, the family of Zacharias Long must consider the possibility that their ancestor was Zacharias Lange, a German mercenary during the first part of the ARW. DNA testing is one alternative to genealogy research, but it is not a substitute to a family genealogy research. The results of a DNA test are based of small samples that are growing. It will take decades before there are sufficient participants to pinpoint precisely in which region of the world your ancestors are from, if ever a large number of participants is reached down the road. Since, DNA testing is also about time, it will still be difficult to know when you started to share a common ancestor with other participants. This science is solely based on mutations that occur in one male chromosome (paternal line testing). Since, a mutation comes around after many centuries, it doesn’t help people who are searching for a particular ancestor in a specific part of the world. Nevertheless, it is very helpful to eliminate regions of the World where you ancestors might have lived. It is very helpful in my research. But, if you find one or many « relatives » through DNA testing, it will help you only if those other participants have already a well research family genealogy. The fact is that most of these participants don’t have a family genealogy and that’s the main reason why they are relying on DNA testing. In any case, you will have to try to built your family genealogy, even though you have interesting DNA results. If you find participants that are closely related to you, you are now faced with chasing many rabbits instead of one! The family of Zacharias Long is quite lucky to know that Zacharias Lange signed the Oath of Allegiance in Philadelphia in 1779. Why? They surely have signed documents by Zacharaias Long to compare with his signature at the Philadelphias Courthouse when he signed the Oath of Allegiance. So, it would be worthwhile to try to get the signed document by Zacharias Lange and compare it to the documents of Zacharias Long, if they have any. The signature is much like a fingerprint. Anyone searching for his ancestor is, in fact, trying to predict his or her life going backward. From what you already know of your ancestor, you’re are really trying to find what we call in research « constants », as opposed to « variables ». For instance, my ancestor was a Loyalist and a soldier. From these two constants, I’m trying to find how and where he became a Loyalist and a soldier. During your search, you will certainly put to the test different hypotheses against such constants. The basis of genealogical research is constancy: what seems to follow your ancestor wherever he went. If you think that I’m searching for a needle in a haystack, you’re right! Since the other alternatives might not be available during this century, I can’t sit and wait for a miracle to happen. It is then possible that, in my lifetime, I won’t be able to link Philipp Lange to Philip Long. So what?